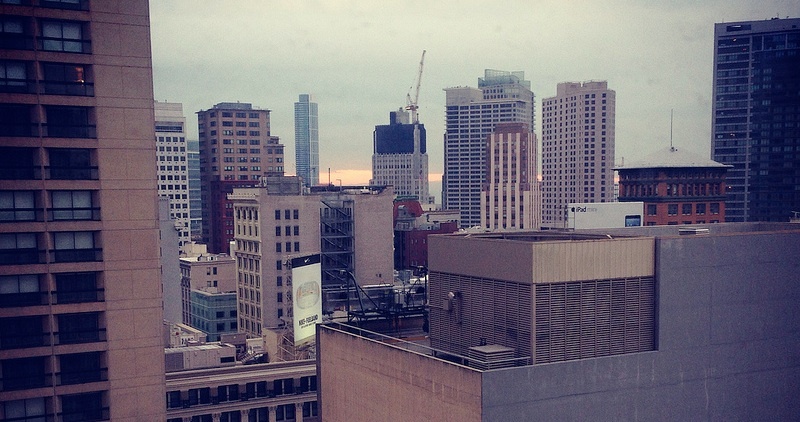 Esri/Geoloqi/Foursquare Hackathon Recap from San Francisco! 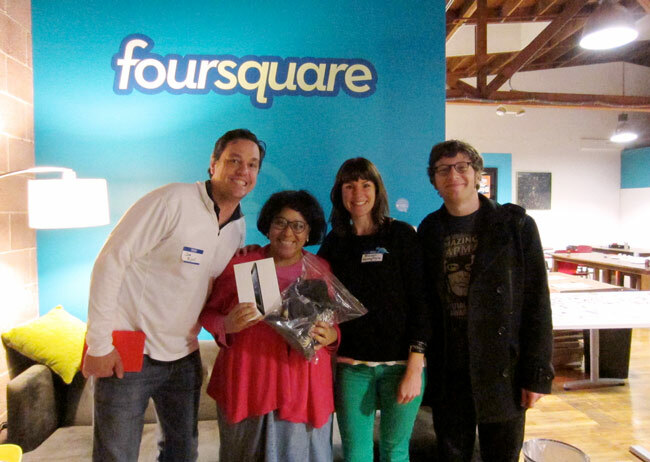 Geoloqi/Esri had a great time at the Foursquare Hackathon this weekend! Not only did tons of people show up to hack (over 200 globally, 100 at the NYC office, and around 50 at the SF office), we got to hang out with our friends Jim Young and Bronwyn Agrios from Esri’s SF office! Together we built interesting stuff, saw interesting hacks, and met lots of new people. 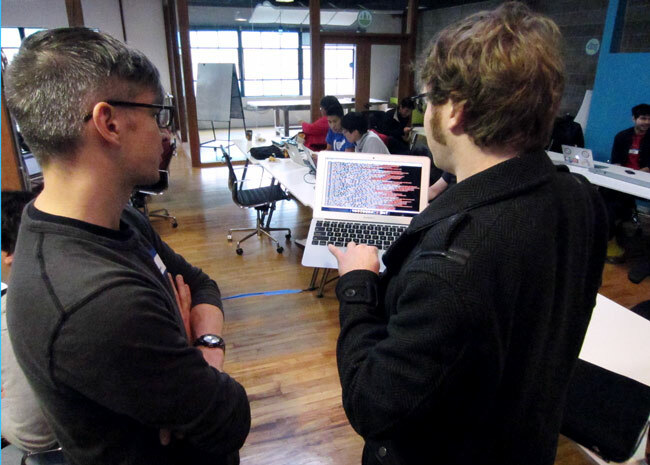 Esri/Geoloqi platform developer Kyle Drake (top right) shows the output of the NASDAQ API to a hackathon participant. Jim Young and Bronwyn Agrios (top right) from the Esri SF get a demo from a fellow hackathon participant. We awarded an iPad prize to Leah Vaughan (second from left) for her great use of an Esri map! Her app was called “Stuck at the Airport”. It recommends interesting places/things to see around you when you’re in transit areas (train satins, airports, rest stops, etc.). Also, Kyle Drake, Aaron Parecki and I put together a hack using the NASDAQ and Foursquare APIs called NASDAQ Facts (below). 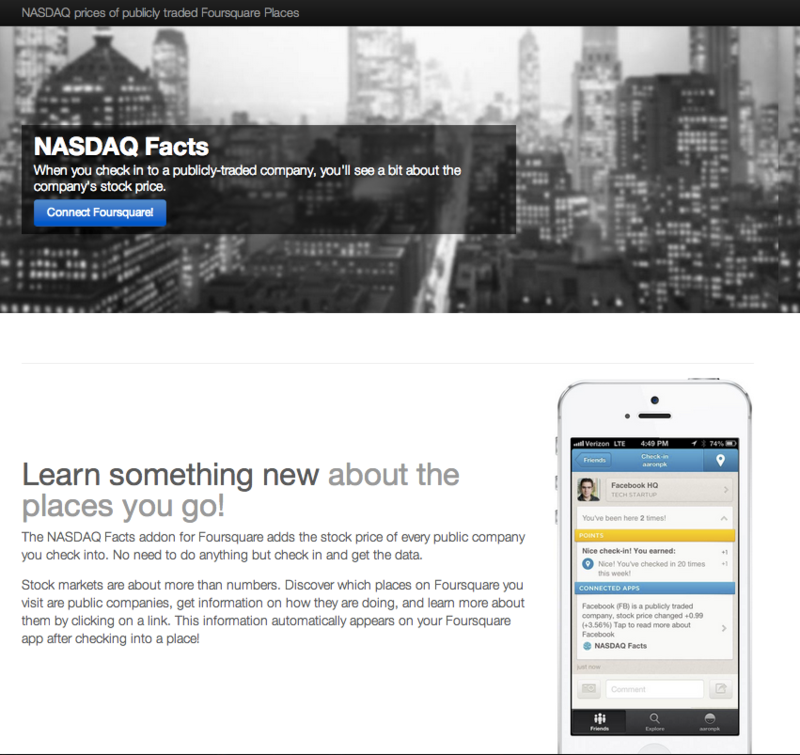 NASDAQ Facts for Foursquare tells you the stock price of every public company you check into. Stock markets are about more than numbers. Discover which places on Foursquare you visit are public companies, get information on how they are doing, and learn more about them by clicking on a link. The information automatically appears on your Foursquare app after checking into a place! (We ended up winning a flying shark for this hack!). 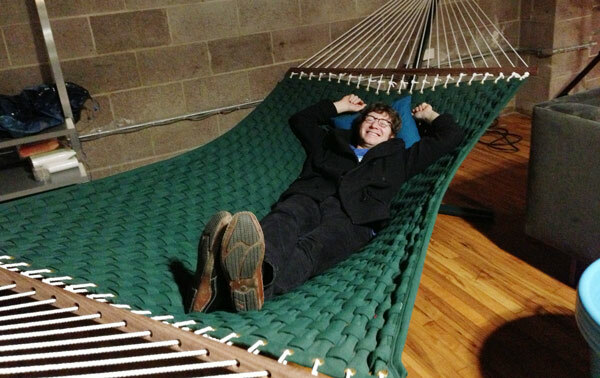 We finished our hacking early, so Kyle Drake hung out in the Foursquare office hammock. You can see a list of all the Foursquare Hackathon projects here, as well as the local winners and global winners! If you’d like to build cool stuff with us in the future, let us know! Who knows? We may soon be coming to a hack day near you! Join Geoloqi and Esri at the Foursquare Hackathon in San Francisco! The Foursquare Hackathon returns this weekend! Come build great connected apps using Geoloqi‘s Geotrigger platform (now a part of Esri!) this Saturday January 5th at Foursquare HQ in SF. Today is the last day to sign up! Build something amazing and you might just find yourself ringing the NASDAQ closing bell, rocking tickets to SXSW, partying with an action figure version of yourself, or wearing the infamous foursquare hackathon TITLE BELT. What tech can you use? Interested in adding location-based messaging to an app? How about getting an alert when you are around items on you Foursquare todo list? Start with the Geoloqi SDK for iPhone or Android, then max it out with Esri maps, intelligent routing, geocoding and more. Consider what your app could do if it knew where it was all the time then add the awesomeness of Foursquare to the picture. Check out the other ideas on the Hackathon Wishlist that require alerts based on proximity or dwell time. You can get a head start on this weekend by signing up for a free account on developers.geoloqi.com, checking out our GitHub repository github.com/geoloqi, and downloading our sample apps from the Apple or Android app stores (for the frequent flier, try Everyday City which lets you automatically share the cities you visit). We’ll have folks from our SF and Portland teams there to get you started using the technology and brainstorm great ideas. Hope to see you there.